IFF Research is always on the lookout for talented people to join our team. Whether you’re an experienced researcher, an expert in data processing, a graduate, a telephone interviewer or a seasoned business services professional, we would like to hear from you. 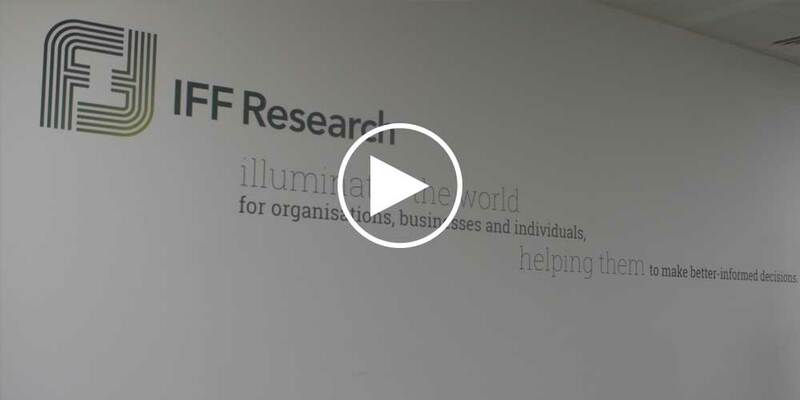 IFF Research was founded over 50 years ago and is now one of the research industry’s leading players in the UK. We collect, process and analyse market information, providing facts and forecasts to help inform our clients’ decision-making processes. We have an attitude to work that welcomes people who think and act outside of the norm. Creative problem solvers who are inspired to help others find solutions, and who are not afraid to be themselves. Our people are bright, fun and friendly – and trusted. We ask everyone to take personal responsibility for their work. We are proud to have built up a workforce community at IFF where our people are engaged, motivated and respected – always mindful of the fact that each person has their own story, and their own means of telling it. IFF helps organisations, businesses and individuals in the public and private sectors to find out robust answers to their questions through various forms of market research. We collect, analyse and report data insights in the form of responses to survey questionnaires, as well as many other sources. IFF is an independent market research agency working in the public sector with government departments to inform policy decisions, and with the private sector to steer companies in the right strategic direction. We are dynamic enough to lead on largescale studies like the Employer Skills Survey (one of the largest B2B surveys in the world), whilst also being agile enough to offer bespoke and cost-effective projects for a wide range of clients. Our people lie at the heart of everything we do. We encourage everybody to be who they are, and we always offer them all the support they need, so that they can become as brilliant as they were always meant to be. Want to join us? Great! Please click on the following links to find out more. IFF has a culture that promotes respect and recognises that happiness is as important a driver to success as anything else. Staff are trusted to manage their days, and rewarded for their hard work with monthly events, as well as being provided with a number of great benefits. Our rules of the game explore what IFF’s values mean practically, day to day, for everyone, as we speak to each other, speak to clients, and carry out our work. Having a set of desired behaviours helps us to keep track of what’s important to us all in terms of how we want to work; they are an invaluable guide for existing staff and new recruits.